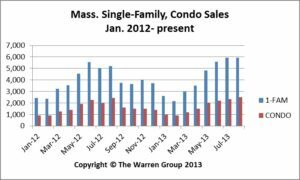 BOSTON, September 24, 2013 – A total of 5,925 single-family homes sold in Massachusetts in August, up from 5,204 sales in August 2012. This is the third time sales have surpassed the 5,000 mark this year. Year-to-date sales are up more than 5 percent at 33,523, compared to 31,851 during the same period a year ago. The median price of a Massachusetts single-family home increased 10.6 percent to $340,000 in August, up from $307,500 a year earlier. This marks the 11th straight month of median price increases. The median price for homes sold January through August was $325,000, up more than 12 percent from $290,000 in the prior year. In August, condominium sales statewide increased 2.5 percent. A total of 2,512 condos sold in August, up from 2,450 a year ago. 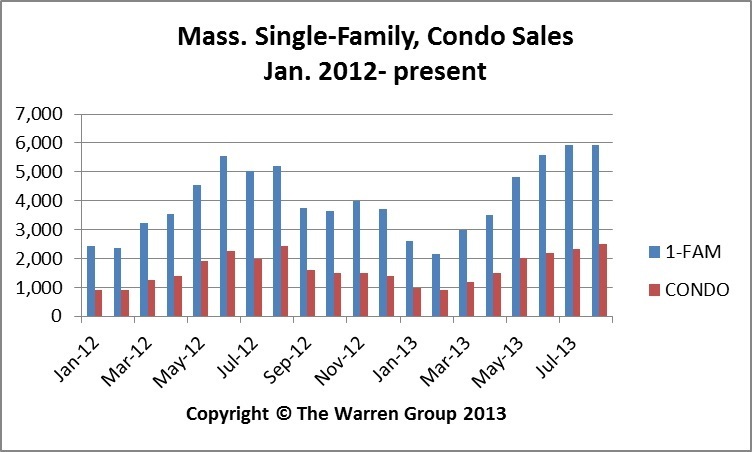 This is the highest number of condo sales for any month since August 2007, when there were 2,965 transactions. Year-to-date condo sales are up almost 4 percent, rising to 13,604 from 13,057 during the same period last year. The median condo price rose 14.7 percent in August to $319,950, up from $279,000 a year earlier. The year-to-date median price of condos in the Bay State is $295,000, up more than 5 percent from $279,900 a year ago.